The start of a new year is a great time to reevaluate your car insurance policy. Will your current coverage adequately protect you and your family in the event of a serious auto accident? Choosing between Full Tort vs. less-expensive Limited Tort may seem like a quick and easy decision, but many don't know that this choice can significantly impact your life if you are ever severely injured in a car accident. Not sure exactly what the difference is? 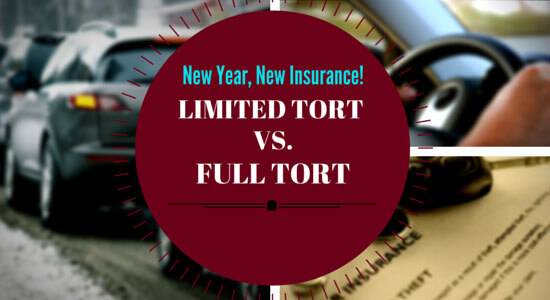 Don't worry, because we've compiled what you need to know about Full Tort vs. Limited Tort below. Limited Tort means that you can sue for limited recovery after an accident. This means that, while you can sue for medical bills, you cannot seek repayment for pain and suffering. If you've never experienced an auto accident, then you might not know why it's important to have the option to pursue compensation for pain and suffering. Car accidents often cause more damage than only broken glass and bent fender. Car accidents can inflict serious injuries, disfigurement, and scarring that may affect you for the rest of your life. "Pain and suffering" is a phrase that refers to any negative change to your life that was a direct result of your accident. It reminds me of one of those commercials where the insurance company has a big red stamp, "rejected." If you have a limited tort they get out the big red stamp, "rejected." One of the first questions you're asked by your agent is do you want full tort or limited tort. A good question. I always suggest choose full tort. If you have limited tort you can only recover for your injuries if you have a serious injury. Unless you have almost a catastrophic injury the kind that could put you in a wheelchair, the kind that'll keep you off work for six months. An insurance company at first pass is just going to say "rejected, you have limited tort." Well you'll say, "heck, I have a serious injury," guess what? The insurance company is going to say almost every time "you don't have a serious injury" and you'll say "but I, but I but, I have, but...." The Insurance company is going to say "you don't have a serious injury and you're not going to get paid." So what happens if you have limited tort, any injury but the most heinous injury, the kinds of injuries where you're not hospitalized for a week or the kind or injury where you're not off work for three or four months. The insurance company says, "rejected, you have limited tort." The insurance companies aren't in the business to pay claims, so if they have a reason to deny a claim, whether it's meritorious or not, they're going to take that reason and deny the claim. Most people choose Limited Tort over Full Tort because they are looking to save money on their monthly premiums. While saving money on your monthly bill may sound alluring, the reality is that Limited Tort could cost you far more in the long run. Sadly, we've been told countless horror stories from individuals who had Limited Tort when they were seriously injured in accidents, and were unable to recover the money they needed from the insurance company afterwards. Full Tort coverage means that beyond your medical bills, you can seek compensation for your pain and suffering. It may cost more on your monthly premium, but it enables you to recover the money you need if you're involved in an accident. Additional compensation can help you get your life back on track and cover any unexpected costs that arise after your accident. It's important to understand that Full Tort is one of the best forms of protection for the future. If you're in a serious accident, you'll more than make up for what you've paid each month. We highly recommend Full Tort coverage for you and your loved ones. At our law firm, we hear from many hurt individuals who are learning that they have chosen an unfavorable auto insurance option, like Limited Tort, for the first time when they contact us. And sadly, when you've already been in an auto accident and are badly injured, this is a very unfortunate time to have to learn that lesson. Don't forget to download our Uninsured/Underinsured Motorist Coverage free of charge. It's packed with great information that can help you decide on the best insurance policy for you and your loved ones. As part of your New Year's resolution, we hope you'll examine your car insurance to better protect yourself. With the right coverage, the aftermath of a car accident can be much less frustrating. Be sure to check out the other blogs in our New Year, New Insurance series, including in-depth explanations of Bodily Injury Liability and Uninsured/Underinsured Motorist Coverage. As always, if you're ever injured in an accident, contact our law firm for a free consultation. It won't cost you anything, and we'll get you the answers – and the legal help – you need.